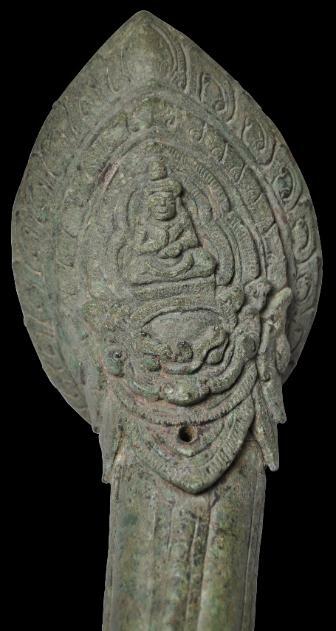 This bronze palanquin finial has been cast using the lost wax process. 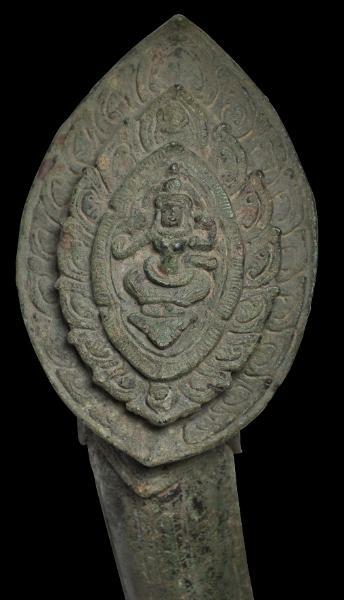 It follows the conventional form of such finials from the Angkor Period. It is curved to allow it to serve as a fitting, and is finished with a well-cast terminal decorated on both sides with spiky, lotus petal motifs around a central figure of a deity. On one side that deity appears to be Hevajra with what seems to b e multiple heads, and on the other the deity sits cross-legged. This figure sits on a throne that appears to be decorated with a kirtimukha mask. The stem of the finial is gadrooned and has at its other end more lotus petal motifs in relief. The finial has a mottled silvery-green patina and is in fine condition. It is accompanied by a custom-made stand. Albanese, M., Angkor: Splendors of the Khmer Civilisation, White Star, 2006. The Age of Angkor: Treasures from the National Museum of Cambodia, Australian National Gallery,1992. Adoration and Glory: The Golden Age of Khmer Art, Art Media Resources, 2004. Gods of Angkor, Bronzes from the National Museum of Cambodia, Smithsonian Institution, 2010. Masterpieces of the National Museum of Cambodia, Friends of Khmer Culture, 2006. Heaven and Empire: Khmer Bronzes from the 9th to the 15th Centuries, White Lotus, 2001. Henry Brownrigg, London. Acquired from a private UK collection. Was possibly acquired from Spink, London.